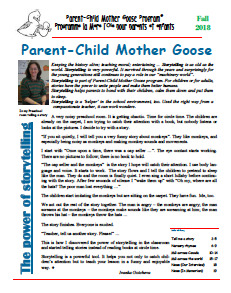 The Parent-Child Mother Goose Newsletter is a great way to stay connected with news about the program, learn new songs and rhymes, and find out about upcoming trainings or events. The fall 2018 issue of the National Parent-Child Mother Goose newsletter includes stories, rhymes and songs, along with news and updates on programs in other countries and across Canada. 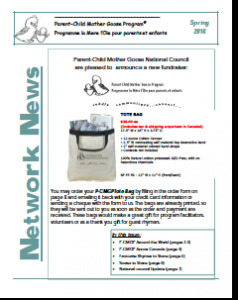 To find out about contributing an item to our next newsletter, please contact our Communications Committee, at info@nationalpcmgp.ca. News about your program, a song, a rhyme, stories and pictures are all welcome!